It was a long awaited process, but it's a girl! It all began with finding two anise swallowtail chrysalids clinging last July to the fennel stems in our pollinator garden in Vacaville, Calif.
To protect them from predators and the elements, we tucked them inside a zippered net butterfly habitat and placed “the prized package” in the corner of a laundry room to await the spring of 2018--and eclosure. The first day of spring, March 20, came and went. Then 288 days slipped by. The chrysalids remained intact. Were they viable? 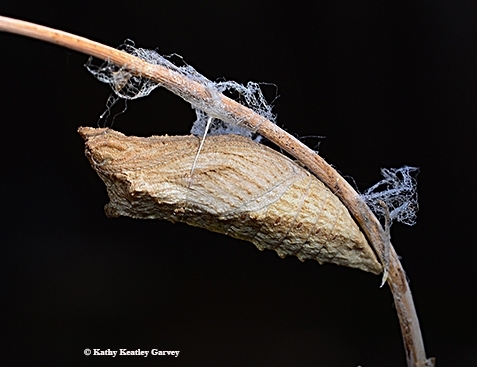 We showed images of the chrysalids to butterfly guru Art Shapiro, distinguished professor of evolution and ecology at the University of California, Davis, who's been researching the butterfly population of central California for more than four decades. So, on June 5, in the refrigerator they went, joining assorted cups of yogurt, bags of fruits and vegetables, jars of peanut butter, cartons of fat-free milk and what-have-you. We placed the (probably) thoroughly confused chrysalids back in the butterfly habitat, but this time, outdoors, and right next to their host plant, fennel. Daytime temperatures climbed to 100 degrees and night temperatures dropped into the 50s. Just as we were wondering if they were still viable, we saw a winged burst of yellow, black and blue on Sunday night, July 14. A long-awaited eclosure! Early Monday morning, we dipped a fennel blossom into a mixture of 10 parts water and one part honey. Food! She drank heartily. 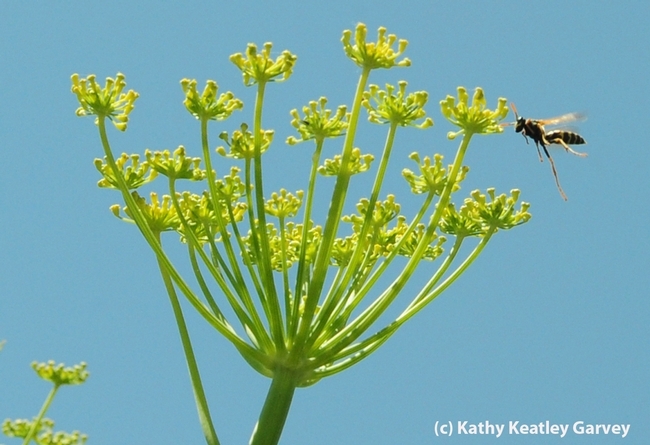 Then we placed her atop the towering fennel so she could warm her flight muscles. Two hours later, Ms. Anise Swallowtail became part of the Wonderful World of Butterflies. She circled the house, returned to nectar on the Mexican sunflower (Tithonia), and left. No fanfare, no ceremony, no celebration. This is her world now. The other chrysalis? It remains intact. Fingers crossed that it, too, will survive. It doesn't get much better than this--in a world where kindness matters. It always has. The Anise Swallowtail, Papilio zelicaon, fluttered into our pollinator garden and headed straight for the Verbena. Art Shapiro, distinguished professor of evolution and ecology at the University of California, Davis, identified the gender: "it's a girl." 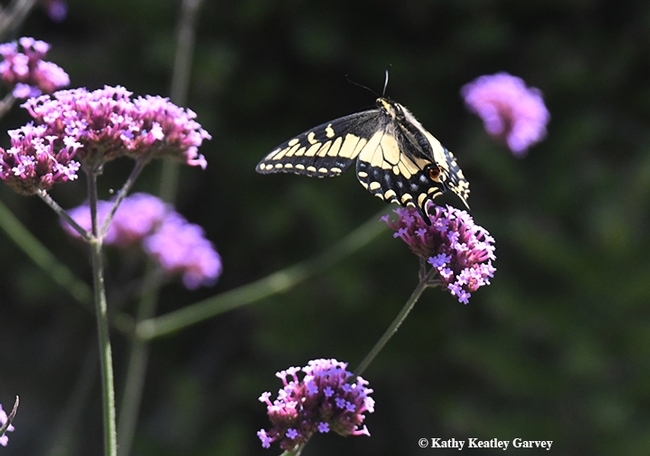 The Anise Swallowtail, our first sighting of the season, bypassed the butterfly bush, Buddleia davidii. But she'll be back--hopefully to gather some more nectar and lay her eggs on our fennel. The Verbena patch was a little too populated for her liking--honey bees and yellow-faced bumble bees, Bombus vosnesenskii, wanted their share of the nectar, too. 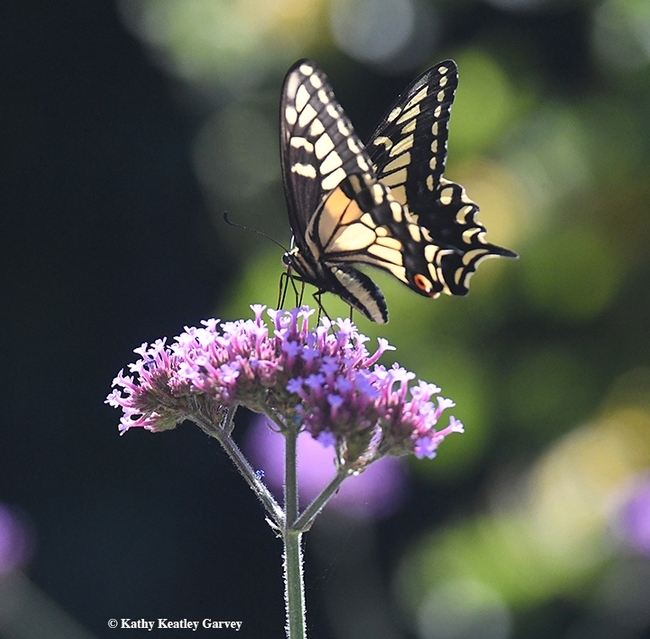 "The Anise Swallowtail is a complex set of ecological races, or 'ecotypes,' whose seasonality has been adjusted by natural selection to match that of their host plants," says Shapiro on his research website. 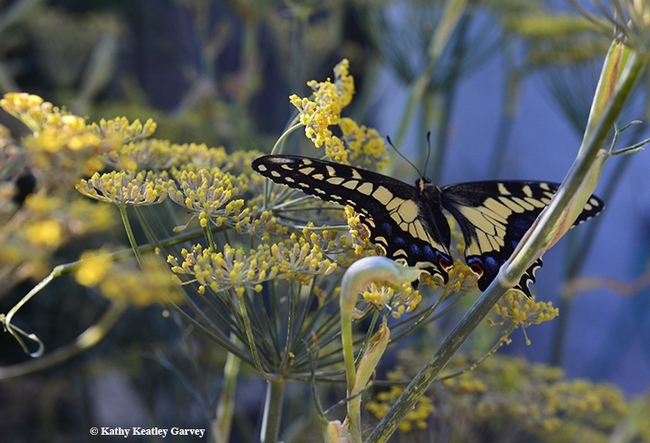 He's studied butterfly populations in central California since 1972. "In multivoltine populations the spring brood is typically small, pale, heavily marked with blue and with narrow dark borders on all wings. Summer individuals are larger, with richer yellow color, broader black borders and little or no blue in males. Univoltine populations tend to be intermediate between these extremes. The small larvae resemble bird droppings. 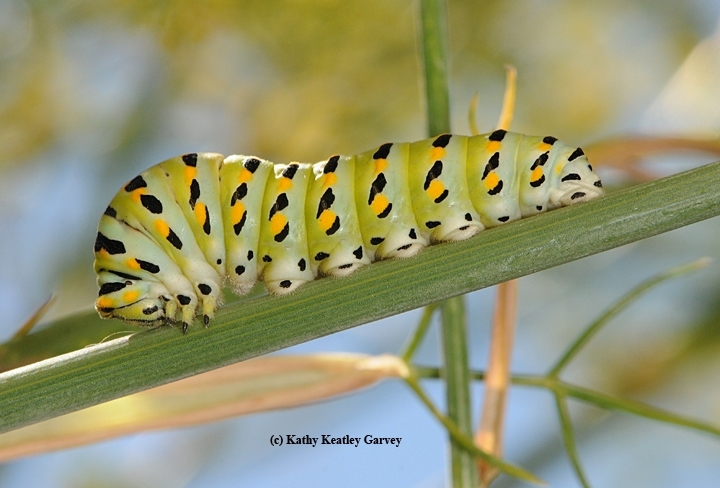 Large larvae are pale green with black bands containing orange spots; in hot, dry sites there is more green and less black, while under cool, humid conditions the green may even disappear! The pupae may be brown or green." 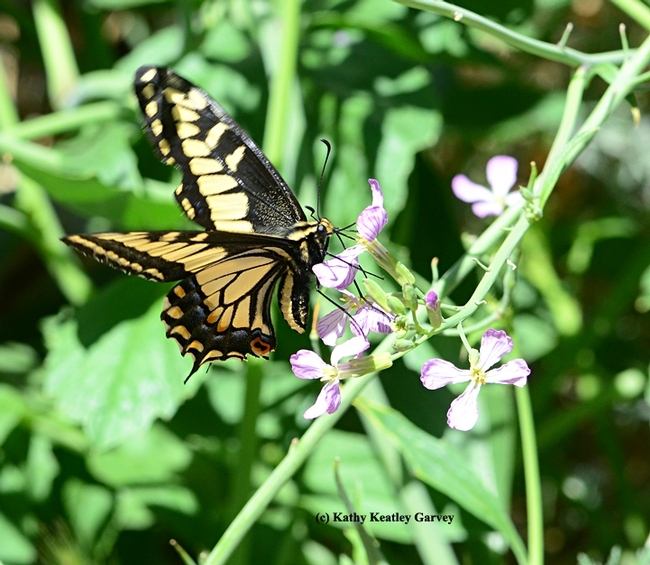 Read more about the swallowtail, including its food sources, on Shapiro's web page. Meanwhile, whether you see your first Anise Swallowtail of the season or the last of the season, you'll want to see more of this yellow-mellow butterfly! 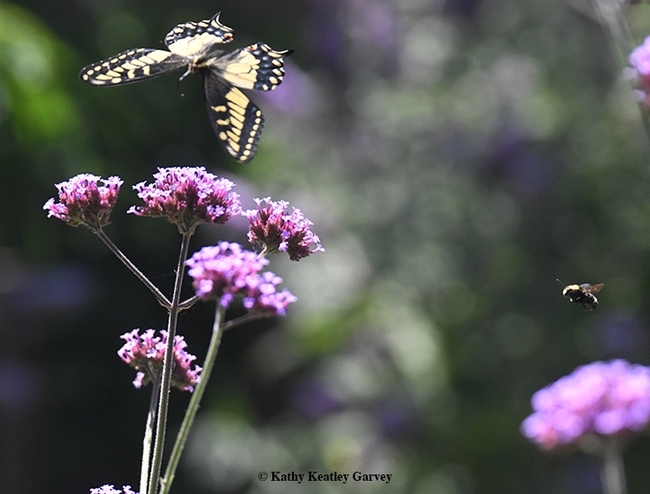 It's a joy to see the anise swallowtail (Papilio zelicaon) fluttering around in community gardens, bee gardens and parks. 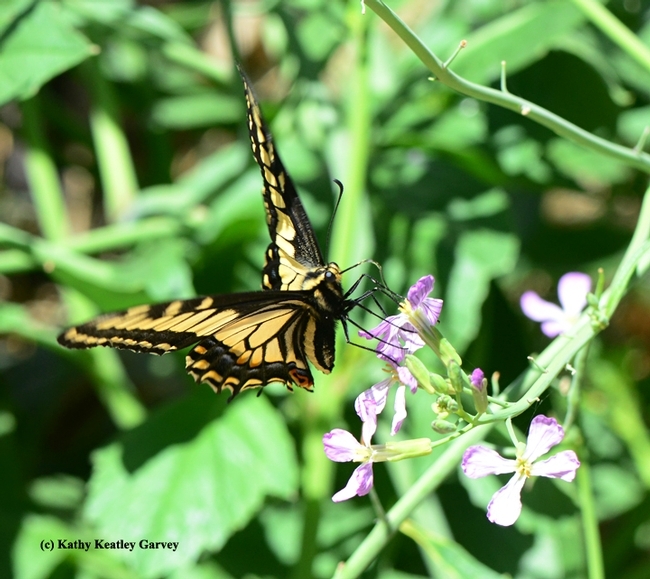 Last weekend in a Benicia community garden, we spotted this sunny butterfly, as identified by Art Shapiro, distinguished professor of evolution and ecology at UC Davis, who monitors Central California butterflies and posts information on his website, Art's Butterfly World. 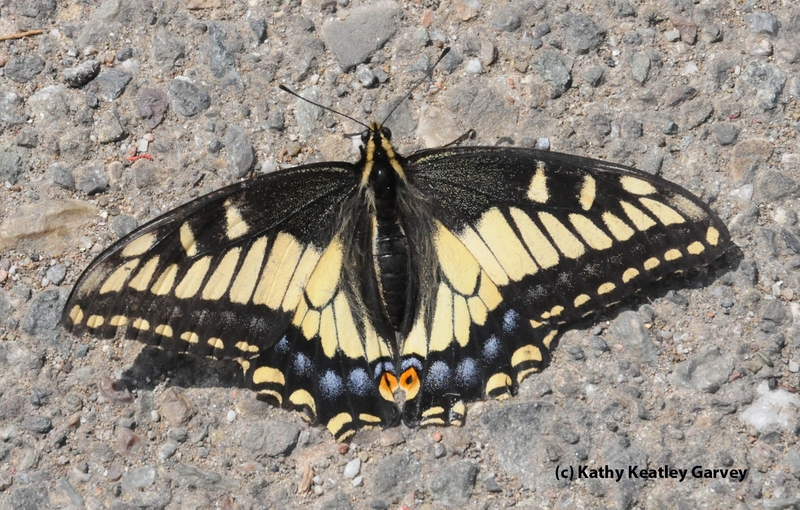 Its distinctive yellow, blue and blue colors remind us of the Western tiger swallowtail (Papilio rutulus). 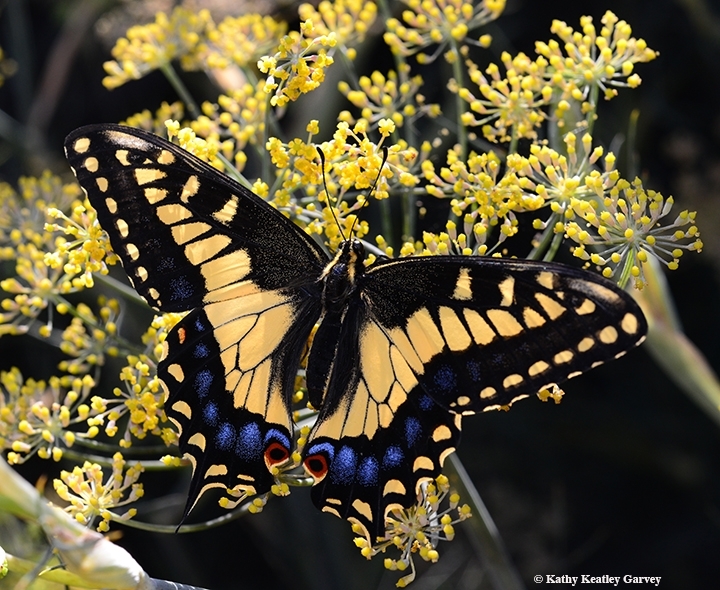 Unlike the Western tiger swallowtail, however, the anise swallowtail has large patches of black on the front portion of its forewing. You'll see the anise swallowtail around its host plant, fennel, Foeniculum vulgare, a weed with a licorice aroma. Anise swallowtails breed on the anise and poison hemlock, Conium maculatum, Shapiro says. Last weekend in Benicia, the anise swallowtail took an interest in wild radish. Check out the beautiful photos of the anise swallowtail on BugGuide.net, which says it was first described in 1852 by Hippolyte Lucas as Papilio zelicaon. That was during California's Gold Rush Days and a year later, in 1853, settlers introduced the European or Western honey bee to California. Anise Swallowtail: Have You Seen Me? 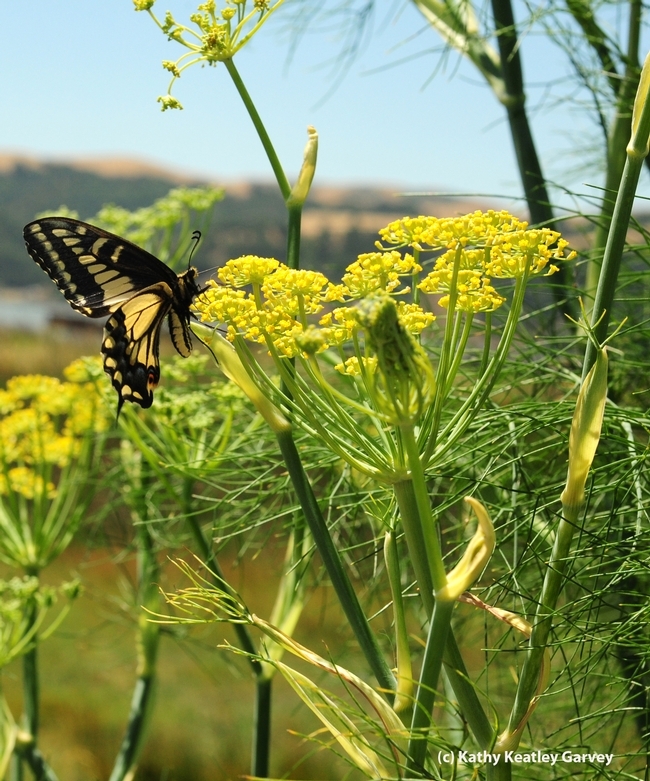 An anise swallowtail fluttered in and out of the tall anise bordering the banks of the Benicia Marina. The female butterfly (Papilio zelicaon), as identified by butterfly expert Arthur Shapiro, professor of evolution and ecology at the University of California, Davis, was probably laying eggs, he told us. The butterfly is often confused with a Western tiger swallowtail (Papilio rutulus). Their coloring does indeed look similar. 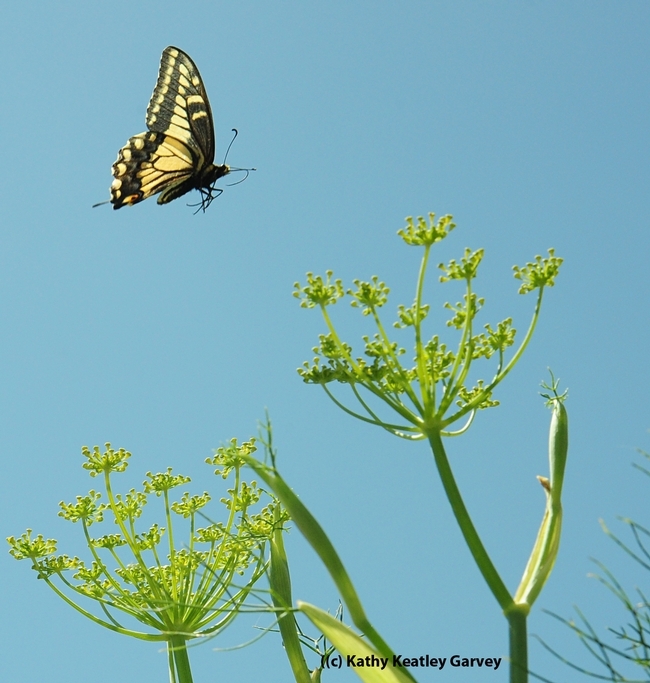 As for the anise butterflies, "they have several generations (late February or March-October) and breed very largely on sweet fennel ("anise"), Foeniculum vulgare, and (in the first half of the season) poison hemlock, Conium maculatum," Shapiro writes on his popular website, Art's Butterfly World. "Both of these are naturalized European weeds." 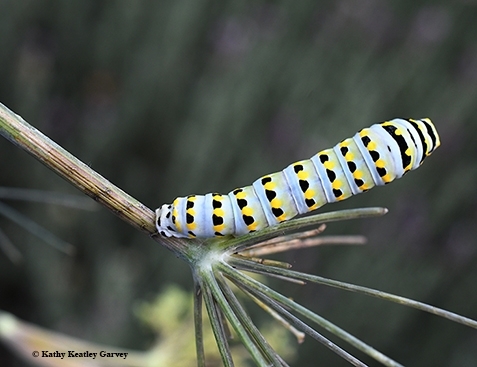 The larvae of the anise swallowtail use fennel as a food plant. Something else about anise: If you crush the leaves, they smell like licorice. While we were watching the anise swallowtail, something else was watching her: an European paper wasp. 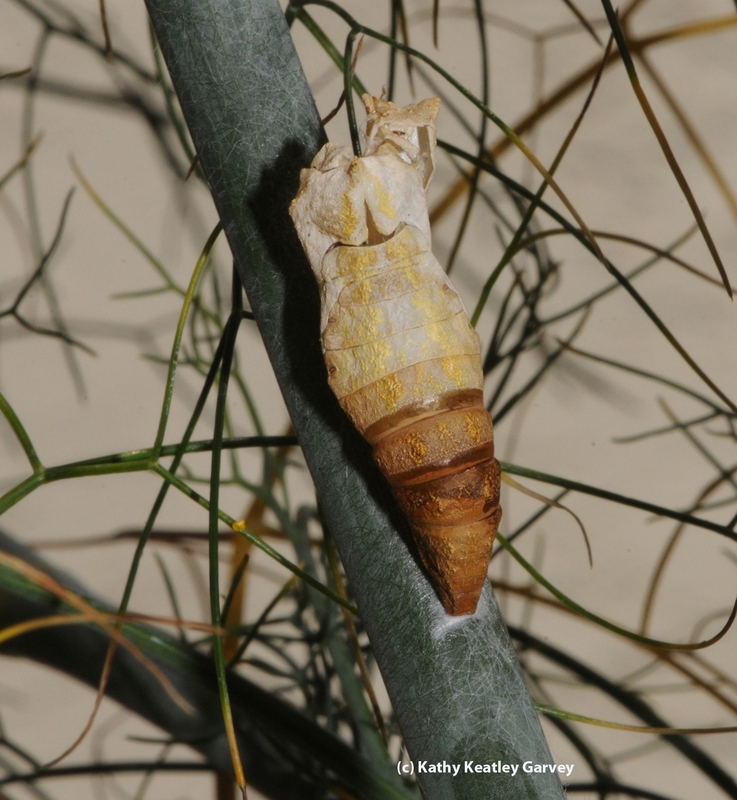 It's called a complete metamorphosis--from an egg to a larva to a pupa to an adult. Metamorphosis--Greek for "transformation" or "change in shape" is spectacular. 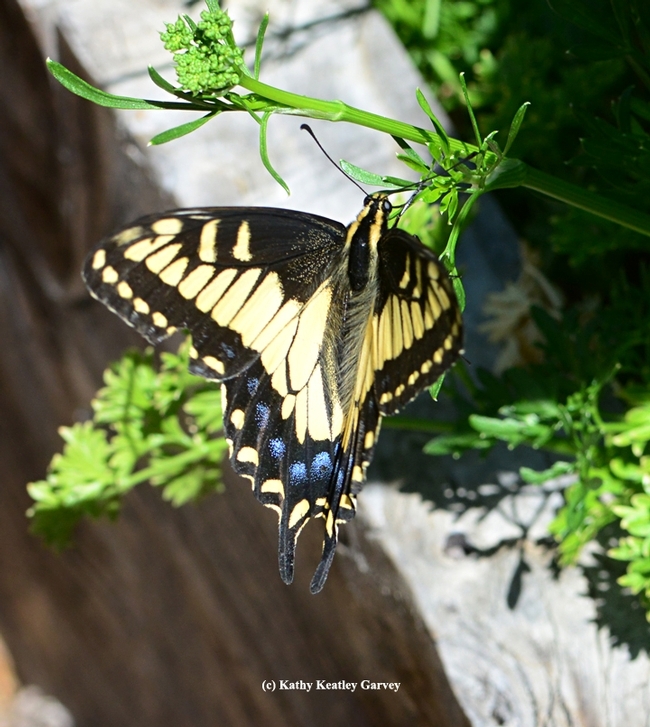 And it's particularly spectacular when the subject is the Anise Swallowtail (Papilio zelicaon). 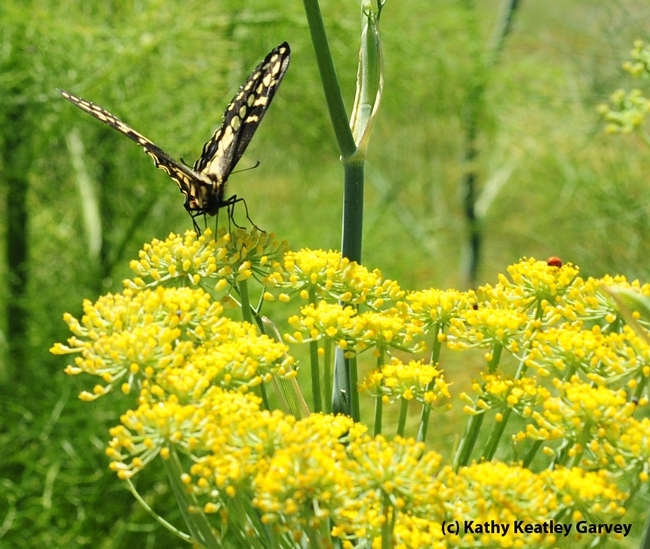 Adult butterflies recently laid their eggs on anise (Pimpinella anisum), also known as fennel, in a friend's backyard in Fairfield. The eggs transformed into larvae (caterpillars) with coloring reminiscent of the adults. We didn't see the first stage, the eggs, but did see the second stage, caterpillar and remnants of the third stage, an empty chrysalis.